Over the last few decades we have seen the introduction of so many new gadgets, utilities and conveniences. Most of these have become part of our lives so much so that we wonder how we survived without them! Some obvious ones are the internet, email, mobile telephones, iPod. Heck, even mundane things like an ATM machine, credit cards, a remote-controlled TV, a split a/c, I can go on and on. How many of us who are now 40 years plus would have seen these in our school days, or even college days? While it is easy to list out the new stuff, you should take a look at some gadgets which were very much a part of our growing up days and are now virtually extinct. Ever think our kids would operate or even see any of the following? In the real old days if you wanted to speak to someone over the phone, you could do so only via an intermediary, the telephone operator. He or she would juggle with some complicated connections inserting wires in multiple slots on a switchboard in front of him and then connect you with your desired number. With the advent of the dial phone and automatic exchanges, getting connected became a breeze! 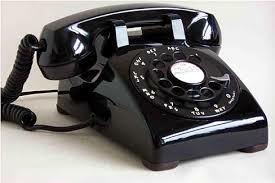 For some reason all the dial phones were black in colour. In its dying years though it did get into bright red and pastel green avatars. These chunky phones occupied the pride of the place in the living room. An extension into the bedroom or any other place in the house was possible but P&T department would charge you an extra rental. Hence telephones with extensions were not too common. Old-timers would remember the telephone dial where the numbers went clockwise from 0 to 9 with each digit having a dedicated slot on the periphery of the dial. You would stick you forefinger into the slot and rotate the dial clockwise till you could get no further. Then for the second digit of the phone number and then the third… till the process of dialing the entire number was concluded. And then you would pray and hope that the call would go through. It was perhaps a 40% chance that the call would go through at the first instance. When it did not, you would repeat the dialing process. Again. And again. Some creative ones would even rest their fingers and use objects like a pencil to do the dialing work. The dialer community had two distinct sub-types. Those who would dial in consonance with the natural speed of the machine and stay with the dial on its return rotation to its orginal position. Then there were the others who would zip through the clockwise rotation as if they were driving their Bullet motorcycle on a highway and then stare helplessly at the dial on its return movement crawl back slowly to the original position in the manner of a moped (remember Luna?) negotiating the bylanes! Very often the dial’s return mechanism malfunctioned forcing the dialer to apply considerable reverse force to get the dial to its original position before the second digit could be dialed! When we got our telephone connection, my father had enough influence in the telephone department not only to get an out-of-turn allotment but also to get a number which others would find easy to dial: 5111. (Jamshedpur had only 4 digit number those days). This was a matter of great pride for us and a source of envy for others who had numbers like, say, 6987! The slots in the dials also enabled enterprising fabricators to fashion little mechanical brass locks which could be affixed to the dial to prevent “unauthorized” people from using the phone. Or so the lock owners thought! I remember circumventing this several times. The system-beater, if you do not know, is simple! Taps of the button on the telephone cradle!! One tap= digit 1, four taps= digit 4 and ten taps for digit 0. This came in very useful on two occasions when someone thought he was being very nice to me by allowing me to receive calls but was “clever” enough to lock the phone so that I could not dial a number on it. The hostel warden in Nagpur where I did my plus 2 course and my landlord in my early days in Bangalore when I was a Paying Guest resident! Why I had to do this is a different story altogether! This gadget was a major symbol of cultural sophistication of a household. Or its affluence. The record player -also called a gramophone- occupied the place of pride in the living room. Often draped with an embroidered cotton cloth or a white lacy covering to keep the dust away! We never owned a record player. Could not afford it! My experience of a record player has been either at my friends’ or relatives’ place. Records would come in different dimensions, though all were black and round. The difference was in the diameter of each and hence the speed you could play a particular record in. The largest one- called an LP, for Long Play- could be played at 33 1/3 rpm while the smaller one- EP or extended play- at 45 rpm. Some really old ones could be played only at 78 rpm! The rpm was set by a knob on the record player, positioned at: 33 1/3, 45 and 78! If you wanted some real entertainment, you could play a playful Kishore Kumar (like in his Jawaani Diwani movie track) at a slower rpm and hear his voice convert to K L Sehgal’s! Or imagine playing a Lata Mangeshkar’s 78 rpm record at 33 1/3! 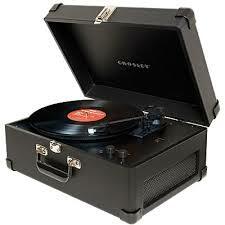 We kids could never figure out how these flat black objects would store music and songs so well! There was something magical to these discs. They would be reverentially pulled out of their cardboard sleeves, wiped free of dust and grime by a special duster and placed gently on the turn table which was covered with a soft felt padding. The “needle” would be placed lightly on the disc taking care that the impact of the needle on the disc was minimal lest the disc get damaged. If the disc did get scratched, the needle would get stuck and the same small piece of the music would keep playing. Like if you were enjoying the aforementioned Jawaani Diwaani number and the needle got stuck, you might here the following: “Yeh jawaaani, hai deewani, hai deewani, hai deewani, hai deewani…”, till someone rescued the situation by nudging the needle along manually! Totally scratched records too had their uses. Like the artistic one in the family would paint on the black surface a landscape, or a bunch of flowers or even portraits of Nehru or Tagore and this disc with its newly acquired work of art would get displayed prominently on the living room walls. Among the many extra-curricular activities I indulged in during my campus days directing plays was one. The last play I directed while on campus was “Kamala”. “Kamala”, written by the famous Marathi playright Vijay Tendulkar, is based on a real-life incident. An investigative journalist out to expose the trading of women in India actually buys a woman from a small town market. He brings her home and plans to keep her there till the time is right to announce this to the world. The journalist’s wife, Sarita, who is well-educated discovers a kinship with the woman, Kamala. When she reflects on her own life and relationship with her husband, Sarita realizes that she is not any better-off than Kamala and that she was getting as much exploited as Kamala. Towards the end of the play Sarita decides that she has to do something about her lot. The play ends with her drunken husband entering the house at night after an altercation with his newspaper bosses. He stumbles in and falls in a drunken stupor. While Sarita is determined to assert herself, her individuality, she also knows that as a wife she has to be a pillar of support for her husband in his tribulations. So that is the story of Kamala in a nutshell. But this piece is not about the plot of the play, but the first staging of my version of it. While I had worked hard on the play, I had worked especially hard on the ending. The way I had envisaged it was that the husband sprawls on the sofa in the living room. (Sarita, who has already made up her mind, decides to support the husband in his trying times). She takes her husband’s feet onto her lap and is in the process of removing his shoes. At this moment I had planned a freeze, a long freeze. While she is in the shoe-removal process (shoe-removal= being a support to her husband), wife looks away to a distant horizon (horizon= her emancipated future). The freeze was planned for ten seconds. This is a very long time for a freeze on stage. A spot was to come on to the wife’s face with rest of the stage fading into darkness. I had got a brilliant young carnatic flautist- a junior in college- to play Raga Bhoopalam which is the raga of dawn (dawn= awakening of the wife, in case you do not get it!). And then, after the freeze, the curtains were to come down on the play. I had briefed another helpful junior of mine to operate the curtains at the appropriate time. After the curtains, would come the giant round of applause, I thought to myself as I marveled at my brilliant conception of the climax. I was sitting in the audience and was watching the play. It was going on perfect! Even the moments where I had found my actors making odd movements during the rehearsals, their movements were fluid, with a capital F! And one of the key actors, who always forgot his lines during tense moments in the play, managed to deliver his lines pat! The audience comprised of my engineering college mates who, as anyone will know, can be very, very painful if the play does not go too well. Especially if the actors involved are their college-mates, which all the actors of “Kamala” were! The was a pin-drop silence in the auditorium! It was going on perfectly well. I eagerly anticipated the applause at the end! Came the climax scene. The husband sprawls picture-perfect on the sofa. In walks the wife and does her feet-on-the-lap and shoe-removal thing. Lightman dims stage lights and turns on the spot on wife’s face. Then freeze! Raga Bhoopalam comes on, as mellifluous as ever. Wow! I am about to start the clapping process myself! Then suddenly, just after three seconds of freeze, our curtain-man decides to get active. He pulls the curtain! I am hopping mad. Hopping! Months of planning and my creative master-stroke shred to bits by a careless curtain guy! Apoplectic with rage, I run down the aisle towards the stage. The hapless curtain-puller in the wings sees me charging down and realizes his mistake. And guess what he does!! He opens the curtain back to full view! I give up and run away from the stage to the back of the hall. The wife and husband on stage mercifully are still frozen and the flautist and the lightman are still sticking to my brief. End of second 12 and the curtain closes again. The round of applause does follow (my friends tell me later), but I do not hear it as I am already outside the auditorium, ruing the day I decided to do this play. I pull myself out of bed and walk towards the tea-stalls near the hostel for a smoke and a cup of tea. The moment I seat myself on the bench, I am accosted by some friends who evidently had been doing a critical review of “Kamala” and wanted to know from me what the symbolism stood for. “What symbolism”, I ask irritatedly. I am agape with astonishment! The errors on stage were being analyzed for their symbolic meanings! You are currently browsing the Santosh Ojha's Weblog blog archives for April, 2009.